I hate that term. A novelization is when the merchandising department hires a hack writer for $15,000 to adapt my script. This is the novel. 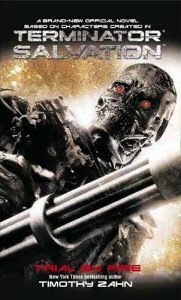 However, given that he’s been not uncomplimentary about some of the movie sequels, one would imagine that Cameron isn’t completely opposed to expanded universe novels like Terminator Salvation: Trial by Fire (by the king of EU, Timothy Zahn), which hit bookstores this week. You can check out a full chapter excerpt here. You might not like it, but hey, at least it’s a novel. This entry was posted in blog, The Word. Bookmark the permalink.